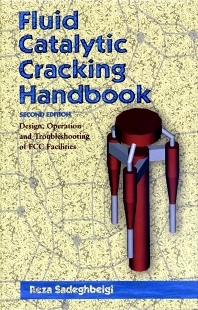 This thoroughly updated edition of Fluid Catalytic Cracking Handbook provides practical information on the design, operation, troubleshooting, and optimization of fluid catalytic cracking (FCC) facilities. Based on the author's years of field experience, this expanded, second edition covers the latest technologies to improve the profitability and reliability of the FCC units, and provides several "no-to-low-cost" practical recommendations. A new chapter supplies valuable recommendations for debottlenecking and optimizing the performance of cat cracker operations. Process flow description. FCC Feed Characterization. FCC Catalysts. Chemistry of FCC reactions. Unit monitoring and control. Products and economics. Project management and hardware design. Troubleshooting. Emerging trends in fluidized catalytic cracking. Appendixes: Total correlations. n-d-M correlations. API correlations. ASTM to TBP conversion. Definitions of fluidization terms. Glossary. Index. Reza Sadeghbeigi is President of RMS Engineering, Inc. a Houston, Texas based engineering firm providing high‐level technical expertise in the area of fluid catalytic cracking (FCC) and related processes. Reza has 35 years of hands-on FCC experience in the refining industry, focusing on technical services, troubleshooting, process design, and project management, including major FCC revamps. A licensed Professional Engineer (P.E.) in Texas and Louisiana, Reza has published technical papers and produced industry seminars on refining and catalytic cracking operations and conducted numerous client customized FCC training courses and public seminars.